After breakfast drive to Agra and transfer to your hotel. Afternoon visit Taj Mahal-The Eternal symbol of India and Agra, built in white marble. 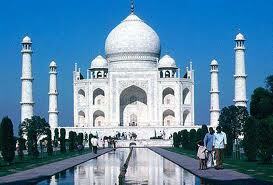 Taj Mahal was built by Mughal Emperor Shahjahan for his wife Mumtaz Mahal. 20,000 workmen worked for 22 years to complete it. Overnight stay at hotel. M orning breakfast at the hotel and drive to Jaipur. En-route visiting Fatehpur sikri- named as The Abandoned city. Built by great Mughal Emperor Akbar, as his capital but after few years abandoned due to scarcity of water. The whole city is built of Red Sand Stone. Breakfast at the hotel and drive to Jaipur. Jaipur is the Gateway to Rajasthan. Also know as Pink city, as all buildings have a pink tint to them. It is an unselfconsciously medieval city, with stately palaces, colourful bazaars (market) and a fort brooding over the city. Graceful women in swirling skirts of red, yellow, orange and magenta, laden with silver jewellery, straight tall men in Turbans and carts drawn by camels, do nothing to dispel the illusion. Morning excursion to Amber fort, enjoy elephant ride over there. Afternoon city tour of Jaipur visit City Palace museum, Observatory and Palace of Winds. Overnight stay at hotel.